One mistake a lot of business make on their Facebook pages is the obvious “Oops, I haven’t posted for a while so I’m going to make up for it right now” posting snowstorm. Considering only a small percentage of your fans generally see your posts, this may not be a terrible idea, but for those who do see them, it can get annoying and ultimately, you will lose fans. As a solution, Facebook has provided tools so you can post what you want when you want to best target your audience. In the past, I’ve mentioned using Buffer to schedule posts to Twitter. 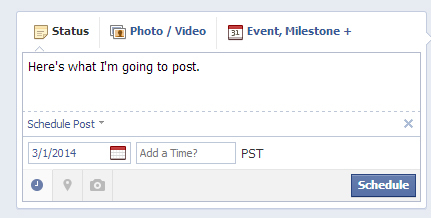 However, I don’t use it for Facebook because Buffer inserts a tag that the post has been scheduled via the Buffer App. The whole goal here is to appear that you have someone actively updating the page, so the Buffer tagline shows that you are not and defeats the whole purpose. After entering a post, click on the clock icon below the status box. Select the date & time you would like your post published. Find content. On one of the pages I administer, I post a daily trivia question. I don’t actually post these every day; instead, I compile the questions and answers in an Excel spreadsheet and spend maybe 15 minutes every few weeks posting and scheduling. That way, my posts are consistent and I don’t have to interrupt my day to post on a regular basis. If you have trouble finding content, here’s a handy post about how to generate content easily. Determine the best posting times. 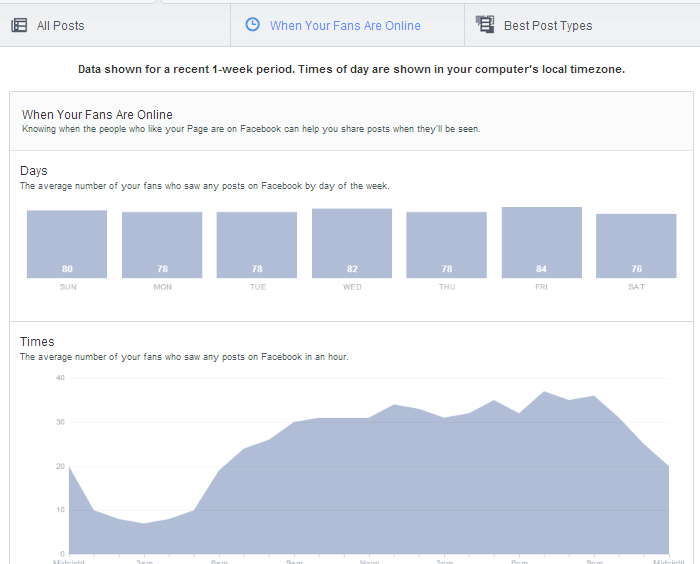 Facebook now offers even more in-depth so you can determine when your fans are online and post accordingly. Just click on “Insights” and choose “Posts” then “When Fans are Online” to determine the best posting times. Schedule engaging posts at peak fan time. Maybe your fans are online outside of business hours. Schedule your posts when they are most likely to see them. Obviously if you’re posting for them to contact your business, you’ll want to schedule that post for business hours. However, for general content, schedule it when your fans are most likely to see it to get the best results. Set aside 10-20 minutes one day a week to schedule posts. Maybe Thursdays are a little slower for you. Set aside a few minutes each Thursday to find content and get it scheduled so all you have to do is periodically check on the page throughout the week. Remember, posting when your fans are online is useless if your posts aren’t engaging. Continue to check the success of your posts and review your best types of posts using the Facebook Insights tool to ensure you are posting what your fans are interested in seeing. Also remember that what works today may not work 3 months from now, so continue to monitor your insights and adjust your types of posts for best results. Previous Previous post: Need Content? Create Your Own Custom Newsroom with Paper.li!